‘Break a leg!’ is a phrase used within theatre circles to wish performers good luck. It may sound rather dire — especially right before a performance — but it is understood to mean ‘good luck.’ Mango Languages can help you differentiate between phrases with different literal and understood meanings, and therefore spare your poor leg from injury. There is some disagreement about the origin of the phrase, ‘break a leg.’ In Shakespeare’s day, ‘breaking a leg’ was understood to be the term for ‘to bow.’ However, others believe that it came from vaudeville in that a ‘leg’ was another term for a side curtain. When you broke the leg, or went beyond the curtain on a stage, you would be paid for your performance. In any case, you can see how the understood meanings of phrases and what they literally mean are often at odds with each other. We all interpret things differently, and the way we say things can lead to some altercations (and this is in English alone!). Imagine how much more confusing it is to converse within the nuances of a different language — where some words are even untranslatable. That’s why Mango is happy to provide some relief from this confusion. 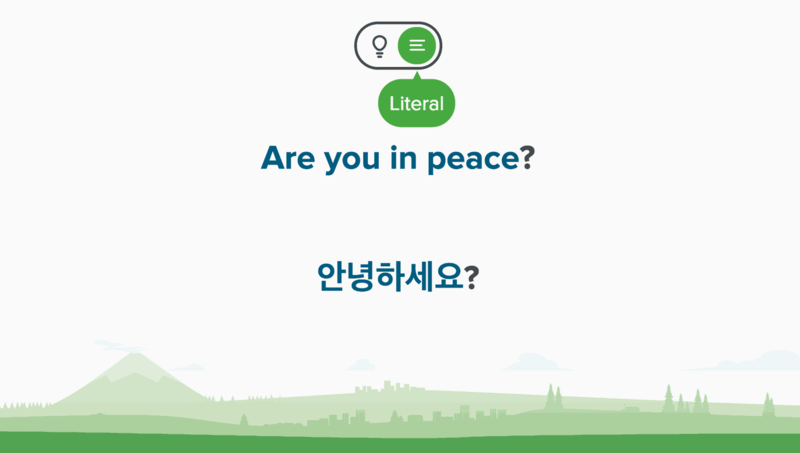 Whenever we introduce certain words or phrases in our courses, you have the option to toggle between the ‘understood’ and ‘literal’ meanings. In addition to helping you avoid misunderstandings, these explanations will give you a better understanding of how languages work. Exploring the differences between literal and understood phrases also helps to show the contextual nature of a language. Learning the literal meaning gives you a better understanding of what is important or not in a language. Mango will help you avoid misunderstandings, false friends, and awkward conversations in over 70 different languages. To be or not to be? That may not be the question. In some languages, ‘to be’ is omitted altogether. In Russian and Arabic, for example, when you refer to present time, the verb ‘to be’ is left out. For example, to say ‘This is my husband’ [Это мой муж], you would literally be saying ‘This my husband.’ To say ‘This is my wife’ [Это моя жена], you would literally be saying ‘This my wife.’ In Japanese, the copula, です ‘desu,’ means ‘to be,’ but it is much more complex than that. In addition, like all Japanese verbs, it is always placed at the end of a sentence. Food makes up a large part of a people’s culture. Every culture has their signature meal, and there are often traditions surrounding the dish. For cultures that are rich in food, their languages can reflect this. In Bavaria, Germany, a common idiom is Das ist mein Bier! [That is my beer!] or Das ist meine Wurst! [That is my sausage!]. At face value, it would seem that the speaker is simply calling out which typical German food item is theirs. However, it actually means something along the lines of, ‘That’s my business!’ If your Bavarian friends or relatives are getting too nosy, tell them to stay out of your stuff (and your beer!) with this handy phrase. The use of beer [Bier] or sausage [Wurst] in various expressions, like this one, can also help us understand how important a particular word is in German culture. The selection of words for either phrases or idioms opens up a window into the daily life of this culture, as well as the important moments in its history. Also, as shown in our German course, when you say, Ich lerne, wie man das Essen macht [I’m learning how to make the food], you would literally be saying, ‘I learn how one makes the food.’ The phrase is a bit more formal and explanatory than in English. It also helps the learner understand how to form ‘how to’ statements. Once you learn one of these phrases, you’ll have the tools to create sentences like this in the future — and make some delicious German food! If you’re planning on having Thanksgiving at your aunt’s house this year, you would also sound a bit more formal expressing this in German. Instead of simply saying ‘my aunt’s house,’ you would say, ‘the house of my aunt’ [Das Haus meiner Tante]. As with the cooking example, by learning this phrase, Mango gives you the tools to structure your own sentences in the future. With this example, you’ll know how to show possession when speaking German. In Mandarin Chinese, to say ‘hello’ you would say 你好 ‘nǐ hǎo.’ Although this is understood to mean ‘hello,’ it literally translates to, ‘you good.’ What is interesting about this phrase (and Chinese in general) is that the language is contextual, like we saw with Japanese. ‘Nǐ hǎo’ is the phrase used for greeting, but by learning the literal translation, you have the tools to form further sentences. For example, by learning I [‘wǒ’], you can say ‘I am good’ [我好]. English and Chinese aren’t so different after all! Thai is another great example of a contextual language, as demonstrated in the greeting ‘Nice to meet you.’ ‘You’ is omitted in the literal translation of Thai greetings, as it is understood that one would say this greeting to a ‘you’ in a conversation. Saying goodbye to someone, even in one’s native language, brings with it its own set of lexical complexity. Do you simply say ‘See you later,’ or do you go for the more formal ‘goodbye’? In other languages, ‘goodbye’ has a completely different literal meaning. For instance, to say ‘goodbye’ in Arabic, you would literally be saying ‘with the safety.’ This could be similar to how in many parts of the U.S., ‘drive safe’ can be considered a farewell phrase. We hope these examples of different literal and understood phrases give you insight into the complex relationship between language and culture. By understanding literal meanings, you can better understand the cultures and contexts that make up a language and become better equipped to confidently converse in the language. With Mango Languages, you can try a lesson in any of our language courses for free! Click the button below to choose a language and get started. Melanie speaks German, Lithuanian, and Japanese and has dabbled in several others. She is an aspiring polyglot and enjoys sharing her passions for language learning and music with anyone she meets.